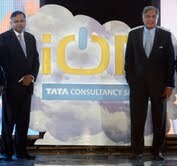 Mumbai: Tata Consultancy Services (TCS) announced the launch of iON – the first-of-its-kind fully integrated information technology solution for Small and Medium Business (SMB). iON provides best-in-class, on-demand business solutions using the very latest in scalable cloud computing technology. It has been developed to deliver IT in the 3rd generation service model to SMBs. Using a pay-per-use business model, iON helps SMBs leverage world-class technology solutions as a key business differentiator. It removes the need for SMBs to invest in IT assets or retain scarce IT talent. iON addresses the entire spectrum of an SMB’s technology needs which range from business solutions like HR, finance, inventory, sophisticated domain-based ERP solutions as well as basic applications like email, document management and website services. iON is pre-configured with hardware, network and software bundled together and backed by business, technical and consulting services. “iON will enhance India’s global competitiveness by giving 35 million Indian SMBs access to world-class, simple-to-use and scalable technology tools. SMBs can use the power of iON to build their business advantage and compete on the global stage,” said Mr. N. Chandrasekaran, Chief Executive Officer and Managing Director, Tata Consultancy Services, and Chief Architect, iON. “Our endeavor has been to ensure the SMBs can grow smarter and faster by having latest technology solutions along with the advantage of a pay-per-use business model that frees up capital to re-invest in their core business. Though premiered in India, iON’s cloud-based services and pay-as-you-use business model is also uniquely suited to SMBs in other developed and emerging markets,” Mr Chandrasekaran added. iON has already garnered over 135 SMB customers. These include SMBs from different industries including education, retail, textiles, wellness and manufacturing. These SMB customers are experiencing the benefits of increased efficiencies; faster go to market, predictability of technology, talent on call and an expanded customer base as a result of iONs end-to-end integrated suite of cloud-based business solutions. To provide SMB customers with seamless service, iON has created an eco-system of 85 Cloud Service Partners across India. iON’s industry solutions are currently available for Manufacturing, Textiles Education, Retail, Quick Service Restaurants, Wellness and Professional Services.